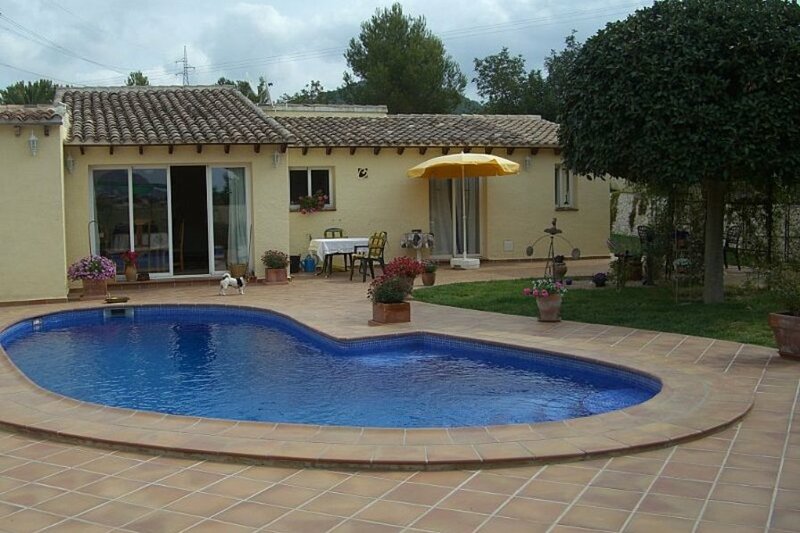 This is a private villa available whilst the owner is attending an extended course in the UK. This is a permanent residence as opposed to a holiday home. Set amongst the Empedrola community on the outskirts of Calpe, this modern property has been stylishly furnished throughout and enjoys beautiful well kept gardens which surround the swimming pool and sun terrace. Great position away from the crowds yet close enough to the beaches and hustle and bustle of the town if you want it. There are a couple of restaurants within 15 minute walk but its probably best to use the car and go into town where you will find a massive choice of places to go. Heading further inland you will find some lovely country walks with super views and no people!!! Here you can really get away from it all if that's what you like. Most people however are happy just lazing about in the garden and around the pool, enjoying the sunshine the privacy and peace and quiet of our lovely villa. The villa is in an ideal position – not overlooked by neighbours and completely private. Covered parking space. A superb built-in barbecue and covered eating area overlooks the pool and is ideal for al fresco dining. Before booking you are advised to compare prices.. eg Owners direct ref s5517 may be cheaper. Calpe and its wide variety of amenities and sandy beaches can be found within a ten minute drive.